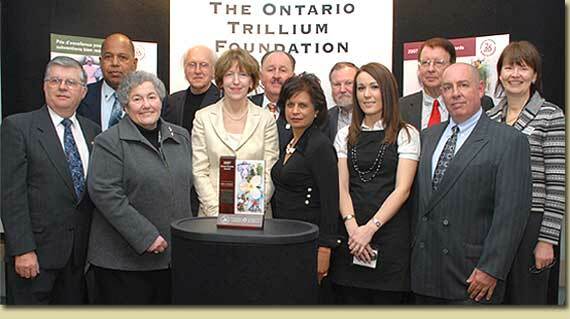 On November 27, 2007 The Ontario Trillium Foundation honoured six remarkable Ontario not-for-profit organizations for the difference they have made in their communities. Arts and Culture: Durham West Arts Centre c/o Rotary Club of Pickering. In 2003, OTF granted the collaborative, led by the Rotary Club of Pickering, $150,000 over two years to help establish the Durham West Arts Centre organization. The funds helped an executive director and support staff to recruit business partners, volunteers and artists to implement new programs. In 2006, OTF made another grant to the Centre to help support its goal of a permanent arts centre in Durham Region. Buckhorn, November 27, 2007 — Six remarkable Ontario not-for-profit organizations were honoured for the difference they have made in their communities at the Ontario Trillium Foundation's 25th Anniversary celebration in Buckhorn Community Centre. The award recipients were selected from among hundreds of grant recipients in the Durham, Haliburton, Kawartha and Pine Ridge area. The Durham West Arts Centre Collaborative received the 2007 Great Grants Award for Arts and Culture for their work in the community between 2003-2006. Angie Littlefield, DWAC Executive Director for the grant period received the award on behalf of the collaborative members: The Rotary Club of Pickering, the City of Pickering, the Durham Board of Education, the Town of Ajax, the PineRidge Arts Council and the Durham West Arts Centre. As stated in the awards program, "If you build it, they will come". In its short history, the Centre has achieved astounding results. Over the granting period, 100 community locations enjoyed arts events, including the Franklin community read-a-thon, and Reading and Remembrance a provincial project honouring veterans. 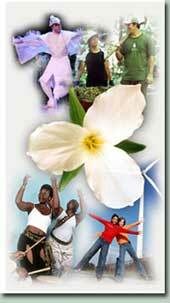 The Centre's cultural connections committee co-ordinated many free multicultural music and dance events. With the determination of this energetic collaborative, "they will build it and the community will come!" Braving white-outs to attend the Buckhorn ceremony were Chair John Sabean, Past Chair Edward Falkenberg, Special Events Chair Shashi Bhatia, Erin Michel, DWAC and DWAC Foundation Treasurer David Green, Membership Chair Marjorie Green and former Executive Director Angie Littlefield. Rotary Club of Pickering member Chandra Chandrakumaran, now on the Trillium Review Committee, was part of the great event. "Thanks to the OTF grant, DWAC has the infrastructure to move forward. The second OTF grant and this prestigious award show that we are right on track. With the news of fantastic new staff just about to break, things will really start rolling," says Angie Littlefield. "When I worked with OTF in the south Oshawa community, we were on our third OTF grant when the City of Oshawa built the Community Centre for which our Collaborative demonstrated the need. I'm hoping that the same kind of thing will happen."